While much of the “buzz” regarding America’s increased energy production has focused on onshore fracking, which has opened up billions of barrels of oil and trillions of cubic feet of natural gas to production, the offshore oil and gas industry continued to provide a huge amount of the U.S. energy production. According to Forbes Magazine, offshore energy production has been increasing this decade and now stands at over two-and-one-half million barrels of oil, and almost three trillion cubic feet of gas a day. This massive production effort is sustained by offshore drilling rigs, primarily in the Gulf of Mexico. And while, the Trump Administration has directed the Department of the Interior to open up new regions in the outer continental shelf to oil and gas exploration, environmental concerns – impelled by major events such as the 2010 Deepwater Horizon disaster in the Gulf of Mexico – have served as a brake of U.S. offshore drilling. Addressing these environmental concerns has been a challenge. Offshore oil and gas companies have been proactive in ensuring the safety and viability of their platforms. That said, using current technology, this is often dull, dirty and dangerous work that impedes routine full and complete inspections of these platforms. Today, platform operators depend on divers and remotely operated vehicles (ROVs) of various types to perform these inspections. The process is slow and tedious and one that puts these divers at excessive risk. Several companies have proposed technology-enabled solutions that can provide faster and more thorough inspections of these enormously expensive platforms and help prevent not only catastrophic disasters, but also more common issues like wear and tear of underwater components. 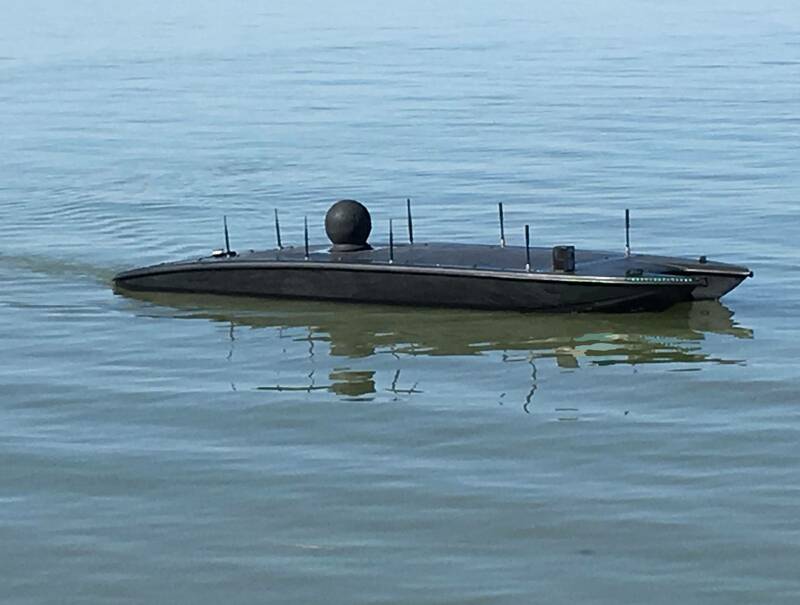 MARTAC Corporation has fielded a family of low-cost, rugged and adaptable unmanned surface vehicles (USVs) called MANTAS which have already been used for civilian missions as diverse as port and harbor security, commercial canal and dam hydrography, and commercial power plant inspections, among others. MANTAS has been used in a series of military and civilian exercises, experiments and demonstrations over the past three years that have thoroughly “wrung out” these USVs. Various size (8-foot and 12-foot) MANTAS USVs have been equipped with a wide variety of surface and below-surface sensors such as the SeaFLIR-230 Gyro-stabilized High Definition EO/IR zoom camera with laser tracking, FLIR M232 thermal camera, FLIR Duo EO camera, Teledyne RESON T20 high resolution multi-beam sonar, Teledyne BlueView M900 single-beam echo-sounder and Norbit iWBMS STX multi-beam sonar, among others. 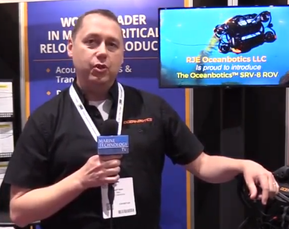 This off-the-shelf technology can be used today to effect faster and more complete inspections of offshore oil and gas platforms along with their surrounding bottom mounted pipelines/valves and sensors, while dramatically decreasing the need for human divers. Under this concept, a 12-foot MANTAS USV would be controlled by one operator in the rig command center. This inspection of bottom valves, vertical pipes, fittings, pipelines and other rig components can be part of scheduled, routine checks or be done on-demand to investigate something out of the ordinary discovered by rig watchstanders. For underwater imaging, the 12-foot MANTAS could be equipped with Norbit iWBMS STX multi-beam sonar, a forward-looking or side-scan sonar, or any of many other commercial-off-the-shelf underwater sensors. For surface investigation, which would include area security, external rig structure investigation and surface contact monitoring, among other missions that a USV like a 12-foot MANTAS is ideally suited for, the MANTAS could be equipped with a SeaFLIR-230 Gyro-stabilized High Definition EO/IR zoom camera, or FLIR M400, M500 or M625CS. Since one of the early indicators of material failure of oil rig components involves oil and other material from the rig seeping into the surrounding water, the MANTAS USV can be equipped with water-monitoring sensors to include Acoustic Doppler Current Profilers (ADCP), Current-Temperature Depth (CTD) sensors, flourometers and others to detect changes in the water quality in the immediate vicinity of the rig. Depending on the mission, operators in the rig command center can control the MANTAS remotely and direct its mission manually, or use the USV in an autonomous or semiautonomous mode to search along a predetermined course through the use of preprogrammed waypoints. Most significantly, the video and sonar imaging from the MANTAS can be sent directly to the rig command center in real-time, thereby providing immediate notification of what the USV discovers above or below the water surface, thus enabling operators and management to make time-sensitive decisions regarding rig operations. Anticipating near-term demand from the offshore oil and gas industry, MARTAC is developing concepts of operations (CONOPS) for how MANTAS would be used to help ensure rig security. For example, an operator in the rig command center might have a MANTAS on patrol on a predictable pattern inspecting the rig above and below water. If the USV discovers an anomaly and links the video back in real-time, the operator will be alerted, can switch to remote manual control, and can command the MANTAS to linger in a particular area for finer-grained analysis. If this investigation uncovers an area of concern, then a diver can be deployed to make a repair. Clearly, this CONOPS will secure the integrity of the rig while also dramatically reducing the false alarms generated of other methods. Conversely, if the investigation does not reveal an issue, the MANTAS can return to its autonomous mission profile that the operator had previously programmed for the USV. Oil and gas rigs in the Gulf of Mexico, while not necessarily bunched together, in some areas are close enough for several rigs to share one MANTAS T-12. With a cruise speed of 20 knots, a burst speed of 40 knots and a cruise radius of 60 nautical miles, several rigs can share one MANTAS USV. Further, the T-12 can carry solar panels to recharge its batteries, greatly extending its endurance/range and enabling increased sharing among multiple platforms. Employing commercial-off-the-shelf USVs that can be rapidly reconfigured with a diverse range of sensors can enhance the ability to deliver energy to America – and the world.